Nebraska is a volleyball state. There’s no question about that after Thursday’s match between No. 7 Nebraska (5-1) and No. 14 Creighton’s (4-3), a five-set thriller in front of an NCAA volleyball regular season record crowd of 14,022 at CHI Health Center Omaha. The Huskers battled back from a 0-2 hole to take down their in-state rivals 3-2 (22-25, 19-25, 25-18, 25-22, 15-10) behind an incredible performance by senior outside hitter Mikaela Foecke. Kloth finished with a match-high 26 kills on .400 hitting but 15 of those came on 25 attempts in the first two sets. Winters added 18 kills and 18 digs but the Huskers held her to .169 hitting. Freshman opposite hitter Jaela Zimmerman, a Lincoln native and Malcolm High School alumna, posted a career-high 10 kills on .400 hitting with two blocks. Freshman setter Nicklin Hames finished with 56 assists and 11 digs while senior libero Kenzie Maloney posted a match-high 25 digs. Sophomore opposite hitter Jazz Sweet chipped in 12 kills on .323 hitting. Nebraska hit .258 for the match and served up 10 aces to 10 errors. After a strong finish against Santa Clara in the Ameritas Players Challenge, Cook gave freshman Capri Davis the nod at the second outside hitter spot and she came out on fire, putting down her first three swings for kills. Cook told Davis it was her turn right before the match. A 4-0 run by Nebraska gave the Huskers a 13-9 lead early, drawing a timeout from Creighton. Whatever Booth said to her team in the huddle seemed to work as Creighton fought back to take a lead at 17-16 with a 3-0 run. Nebraska tied it on a kill by Foecke but the Jays pulled ahead at 20-18 before the Huskers tied it again at 20-all. Creighton answered with two straight to draw a timeout from Cook. 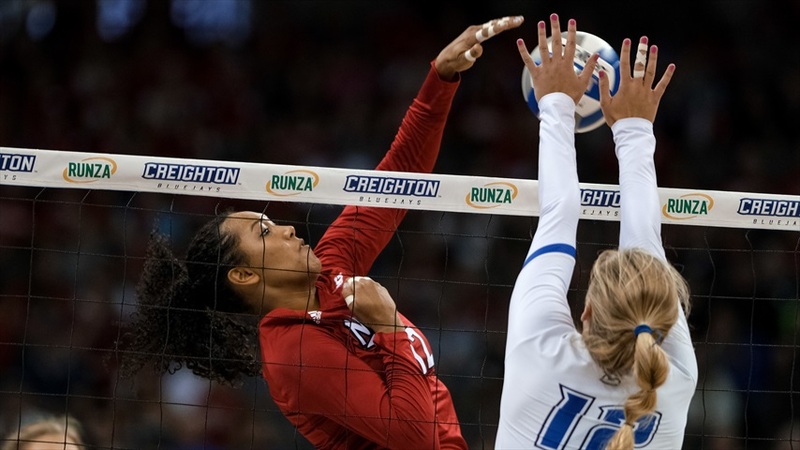 Nebraska pulled within one twice but couldn’t get over the hump as a service error gave the Jays set point and Kloth ended it by tooling the block clear across the court for a kill. Creighton got off to a fast start in the third set, using a 3-0 run to pull ahead 7-4. Nebraska closed to within one but the Jays blew the game open with a 7-0 run and cruised to victory from there as Kloth continued to wreak havoc for the Jays. Creighton hit a blistering .457 in the set. Nebraska refused to go down without a fight, however, opening the third with a 6-1 run and the Jays never got closer than three the rest of the way. Nebraska stretched its lead out to eight at 17-9 before a 3-0 run by Creighton. After trading points, Nebraska got its advantage back up to eight with a 3-0 run of its own and the Huskers finished off the set for a seven-point win to extend the match. Foecke came alive in the third with six kills and three blocks as the Huskers held Creighton to .023 in the set. Nebraska kept it rolling into the fourth set with a 5-0 run early to take an 8-3 lead. Creighton cut its deficit to two at 11-9 but Nebraska countered with a 5-1 run to take a 16-10 lead. Creighton returned fire with a 4-1 run, drawing a timeout from Nebraska, and the Huskers came out of the break with a 3-0 run of its own to push it back to 20-14. Creighton battled back into it with a 6-2 run but a pair of kills by Foecke and one by Davis finished it off at 25-22, setting up a fifth set. Nebraska out-hit Creighton .265 to .162 and held Kloth to three kills and two errors on 14 swings in the fourth set. Nebraska took the first two points of the final frame before both sides settled into a back-and-forth tussle. It looked like Creighton was about to tie it up with a strong serve that a Husker misplayed but Hames chased the errant pass down, running into the press table while bump-setting the ball back into play and Foecke and Lauren Stivrins teamed up to block Ballenger to get the point and put Nebraska up 7-5. 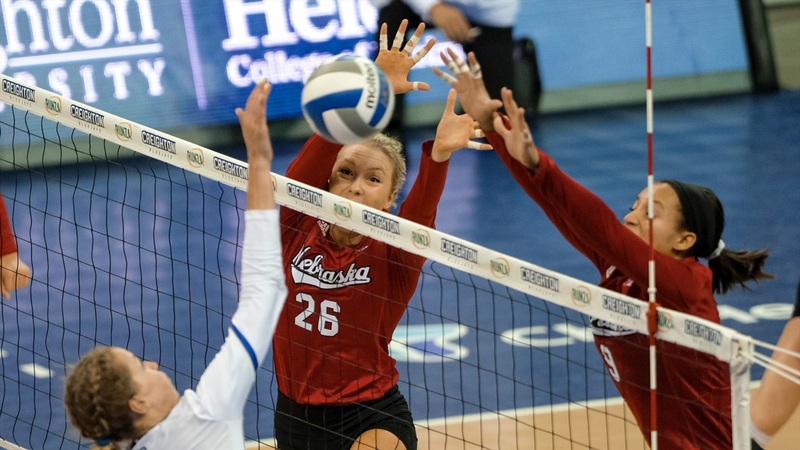 Foecke pounded her career-high 23rd kill to give Nebraska an 8-5 lead as the teams changed sides then teamed up with freshman Callie Schwarzenbach to block another Creighton attack to make it 9-5 before the Jays got on a run to pull within one at 10-9. Foecke followed that play up with a kill and two aces to make it 13-9. Creighton got a kill from Kloth but Sweet answered for Nebraska to set up match-point and Maloney ended it with an ace. Foecke had five kills, two aces and two blocks in the fifth set. After putting up 16 kills in her first four matches, Davis finished with 18 kills on 49 swings with five digs. It was the first time all season she’s played from start to finish. Nebraska will get a few days off before returning to the Devaney Center to host Iowa State on Sunday afternoon. The Cyclones (5-2) were just outside the top 25 in the latest AVCA Coaches Poll and will first participate in Creighton’s Bluejay Invitational, taking on the Jays on Friday and Wichita State on Saturday. First serve between the Huskers and Cyclones is set for 1 p.m. on ESPNU.